When we first brought in Dr. K it was really based on his demeanor and elegance. Now after 60 plus Goddess’s have used his Plastic Surgery skills in the last year (2013) we know we were blessed and made the right call. Dr. K is a genius at what he does. He is a Plastic Surgery Genius. And we are grateful to have him here at Celebrating Women Center in Oxnard. But don’t just take our word for it…. Ob/Gyn – Plastic Surgery- Weight Loss and more! 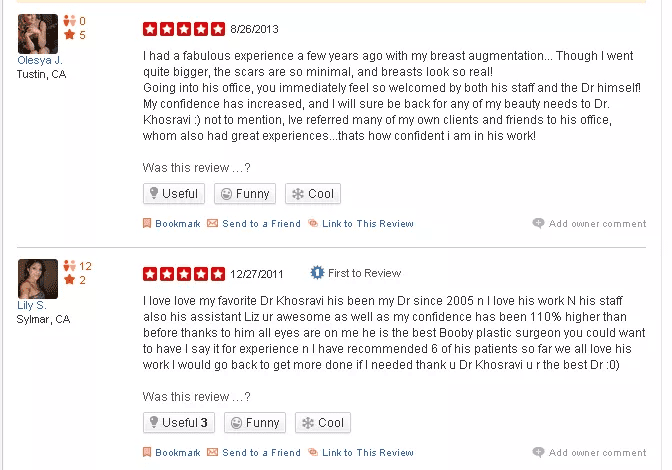 These reviews were taken from sites like Yelp, DoctorBase, and Realself.